A North Korean regular infantry division is the most likely type of division a US unit would face on the Korean peninsula. While the Korean People’s Army (KPA) fields armor and mechanized units, the number of regular infantry units far exceeds the other types (pg 3). KPA offensive operations include the heavy use of artillery with chemical munitions; a primary focus of attacks on combat support (CS), combat service support (CSS), and command and control (C2) units; and deep operations conducted by KPA special-purpose forces (SPF) (pgs 3–4, 11–16, 21–23). KPA defensive operations focus on the elimination of enemy armor through the heavy use of artillery; battalion, regiment, and division antitank kill zones; and the use of counterattack forces at all levels above battalion-sized units (pgs 16–19, 23–26). While US forces will face KPA conventional infantry to their front, KPA SPF will initiate offensive operations in the US/South Korean rear areas to create a “second front” (pgs 15–16). KPA regular forces and SPF will remain in place to conduct stay-behind annihilation ambushes on CS, CSS, and C2 units passing through the passed unit’s area of operations (pg 25). The KPA divisions are already prepared to fight US and Republic of Korea (ROK) forces today. The vehicles and equipment may be different in the future, but their tactics and techniques will be similar to those used today (pgs 10–26). Since 2003, the KPA has created seven divisions that are specialized to operate in urban and mountain terrain using irregular warfare techniques. It is expected that the KPA will use several techniques deemed successful in Afghanistan and Iraq against US/ROK forces (pg 20). TRADOC G-2 ACE Threats Integration (ACE-TI) is the source of the threat tactics series of products. 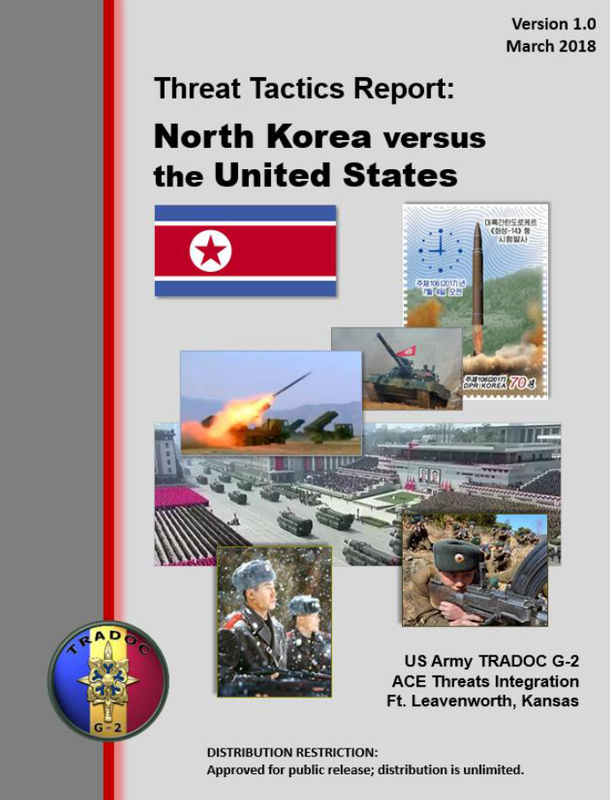 The Threat Tactics Report: North Korea versus the United States (US) and the other similar products serve to describe the foreign nation’s most common combat division with an order of battle, its offensive and defensive doctrine as articulated in its manuals or recent military actions, and an analysis of how this actor would fight if facing the US in the future. This document is intended primarily for US Army training organizations, but will be applicable across the wider community of US Army Combatant Commands, Army Service Component Commands, and allied partners. The KPA uses a variety of primarily Tier 2, 3, and 4 equipment in its units, as it rarely disposes of any weapons. The best units receive new(er) weapons and their systems are then cascaded through the lower-quality units. Some of the KPA’s weapons and vehicles date back to World War II. Units will attempt to field the same type of weapon systems to reduce logistical issues. The following are some of the major weapons found in a KPA infantry division or infantry regiment. The KPA prefers the offense over the defense and will stay on the defensive only until it can gather the strength to attack again. The KPA will attempt to avoid US/ROK combat units and will attempt to attack CS, CSS, and C2 units and vulnerable high-value targets in the rear areas in order to reduce the effectiveness of the US/ROK combat units. With assistance in creating a second front via the KPA SPF making these attacks in the US/ROK rear areas, the KPA believes the US/ROK combat units will become combat ineffective, making them vulnerable to KPA follow-on forces. When forced to go on the defensive the KPA will concentrate its efforts in eliminating its enemy’s tanks. Any units bypassed by enemy forces are directed to continue to fight as a unit or, if the unit becomes combat ineffective, the soldiers are expected by their leaders to continue resistance by conducting irregular warfare operations against any enemy units in their area. Prepared UGFs exist throughout North Korea, especially within 50 miles of the DMZ. If forced on the defensive in these areas, the KPA will fight from these previously prepared positions. US/ROK units will face intense indirect fire including chemical munitions, conventional KPA units to their front, and SPF elements in their rear areas. US/ROK units will need to simultaneously defeat the KPA divisions attacking their combat units, while defending all units from KPA SPF or stay-behind forces in their rear areas.